Talking Brains: What does motor cortex contribute to speech perception? Is it just response bias? What does motor cortex contribute to speech perception? Is it just response bias? I've been worrying about bias in speech perception experiments for months, particularly those that purport to show that the motor system is involved in speech perception. The concern is this: virtually all of these studies used measures, such as percent correct or reaction times in forced choice paradigms, that are potentially biased. Modulations in performance as a function of whatever manipulations are used could result from modulations in perception (what most people are interested in documenting) or modulations in response selection. A typical experiment is this: subjects listen to pairs of CV syllables and decide whether they are the same or not. In one condition, they receive TMS to one or another motor area and in the other they get sham stimulation or some other control. A typical result: percent correct significantly decreases or RTs significant increase with motor stimulation. Typical conclusion: the motor system is causally involved in speech perception. Problem: you don't know whether the effect is happening in the perceptual analysis of the CVs or whether it is modulating the decision process. This worry led to the following experiment, spearheaded by Jon Venezia in my lab. Using fMRI we modulated response bias while keeping perceptual discrimination constant in a CV same-different discrimination task. Response bias was manipulated by changing the ratio of same to different trials. The stimuli were otherwise identical. 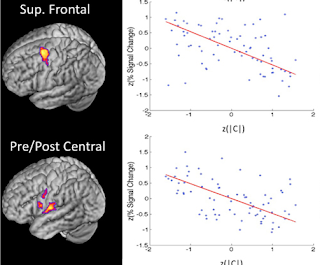 We then looked for the neural correlates of response bias changes. Behavioral results confirmed the intended effect: response bias (measured using the c, or criterion, statistic) was significantly modulated as a function of the ratio of same to different trials (p < .001) whereas d' (perceptual discrimination) was unaffected (p = .384). The figure below shows the clear effect on bias (top panel) and the somewhat wobbly effect on proportion correct (p = .061). Turns out these regions line up quite well with those regions that, when stimulated with TMS, yield effects on "speech perception". This is not conclusive evidence that all previous effects of motor modulation on speech perception are a result of response bias alone, but it does seriously question the validity of these reports and makes a strong case for the view that we need to take bias into account when measuring "speech perception." Venezia, J. H., Saberi, K., Chubb, C., & Hickok, G. (2012). 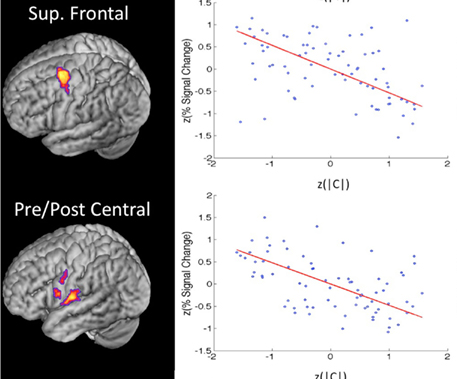 Response bias modulates the speech motor system during syllable discrimination. Frontiers in Psychology, 3. Thanks for your post. I have some few comments on the nice study you performed with Jonathan Venezia, Kourosh Saberi and Charles Chubb. You rightly mention that “two conditional, Gaussian probability distributions – one for noise trials and another for signal+noise trials – are used to model the likelihood of observing a particular level of internal(sensory) response on a given trial”. And, then, “the normalized distance between the means of the two distributions, known as d’, is taken to be the measure of perceptual sensitivity (i.e., ability to detect the signal), where this distance is an intrinsic(fixed) property of the sensory system. However, the participant must set a response criterion – a certain position on the internal response continuum – for which trials that exceed the criterion response are classified as “signal”. My first point is that d’ is surely “an intrinsic property of the sensory signal” but does it mean to you that response bias has nothing to do with the sensory system? Considering the scope of your study, as you perfectly know, many, if not all, current neurobiological models of speech perception argue for bidirectional sensory-to-motor and motor-to-sensory projections (generative/predictive models), the role of the motor system being to ‘constraint’ the phonetic interpretation of the perceived speech signal(s) based on procedural knowledge of the listener. Especially, as you rightly point out previously, in case of meta-phonological tasks (like here, using a two-forced choice same-different syllable discrimination task). To further clarify my point, d’ and bias scores are usually thought as independent measures. But, I don’t get the implicit point you make that they should rely on distinct brain areas or networks. Your study provides evidence for a significant bias response and a correlation between criterion scores and motor activity (among other regions). But, also, from your whole-brain group analysis, activity of the pre- and sensorimotor cortices are huge (see Figure 4; as activity in the SMA, cerebellum and large parts of the parietal cortex like in many verbal working memory studies). I am surely wrong but given that you did not get any significant effect of d’, could it mean that all these regions are equally activated during your task regarding d’ and whatever the condition? In my view, a simple way to test this hypothesis would be to model the bias effect and to remove it from your analysis to see whether motor activity still remains, and to do the same thing with d’ (even not significant). Thanks for your feedback. Yes, most current models of speech perception include or at least give a nod to motor-to-sensory feedback loops that can allow for predictive coding in auditory cortex and therefore provide a mechanism for motor systems to have a real influence on perception. As you know, although I've argued that sensory-motor circuits exist for controlling speech *production*, I have acknowledged that such circuits might be exapted for perception. The question is, are they in fact used in perception? My opinion has been agnostic but more recently has started leaning toward, no. There are almost no studies that address this directly, taking bias into account and those that do seems to implicate motor systems in response selection (bias) rather than playing a role in perceptual discrimination. My position on the current state of the field is this: there is NO evidence that motor system actually modulates perceptual discrimination. Yes, there are plenty of studies that claim to show this, even causally, but all are potentially contaminated by bias and so remain inconclusive. Further, there is suggestive evidence that the motor system contributes to response bias (your study, the present one, and previous lesion reports that damage to Broca's area-ish causes significant changes in the number of "yes" responses in a 2AFC task). So, the empirical record is equivocal at best, which is why I was agnostic in the past. Why am I leaning toward the view that motor prediction plays no role in perception? Because there's a conceptual problem with the idea. The goal of motor-generated sensory prediction in the context of what it was designed to do (control action) is to *inhibit* the response to the predicted sensory consequences of a movement. The system is set up to ignore sensory feedback that matches prediction (all is as expected and the movement can proceed as planned, i.e., do nothing). It only needs to notice and react if the prediction does not match the feedback (there's an error, recalibration is needed). Consider saccadic suppression as a classic example. The sensory motion percept is effectively suppressed by motor prediction, so you would never want to generate predictions from eye movement plans to enhance perception of visual motion. Why should it be different for speech? In short, the computational goal of motor prediction would seem to be maladaptive for speech perception. David and I are working on a more detailed position piece on this theoretical point so stay tuned. Of course this is an empirical issue and if motor-generated prediction actually enhances speech perception, than so be it. It's going to take very strong evidence though, in light of the conceptual problem with the idea. You mention the task issue. Yes, we see lots of activity in motor-related areas in the global activation maps. Not surprising given that sensory and motor systems are connected (for production purposes) and that our task relies on motor systems. But this doesn't mean that the perceptual analysis of the signal relies on or is modulated by the motor system, which is what we sought to disentangle from the global activation pattern. Regarding your thoughts on other ways to analyze our dataset, Jon V. has been working on some alternative analyses and could chime in with some details. I am so happy with this remark! I am currently studying the role of the ventral premotor cortex in language (with the use of intraoperative language mapping) and when I did a literature review on the (ventral) premotor cortex and its function in language I was amazed about the number of studies which were discussing the role of the premotor cortex in speech perception (Wise, Guenther, Friederici, Kansaku, Meister, Iacoboni, Osnes, Tremblay). It will be very interesting to see how this will evolve, now that you made this statement (a bit different from your paper in 2004). I will keep an eye on this subject matter, as I feel it is a very interesting one! I am still relatively new to all this but maybe speech perception can even be studied with intraoperative mapping, I might be able to discuss this with my supervisor. 2. Areas sensitive to response bias, particularly those relevant e.g. in Pulvermuller et al 2006, are most active when little bias is present. What does it mean? You’re offering, in principle, two answers which both may be related to the role of phonological working memory . Another alternative within the latter answer is predictive coding. Like working memory, predictive coding would perhaps need more activity if bias is absent or neglected. Or am I wrong? Moreover, can’t predictive coding and working memory even be complementary rather than mutually exclusive? I don’t understand the reasons behind excluding predictive coding. 3. Is there a way for TMS studies using unbiased measures? 1. I agree that perception is for action. But the brain seems to be organized our perception that is for action NOW (dorsal stream) vs. perception that is for action sometime in the future (ventral stream). 2. It's hard to know exactly what's driving the direction of the effect. We offered some suggestions related to working memory-like processes. You suggest predictive coding, which would be needed when bias is absent. Here's the problem I have with this. Presumably predictive coding via the motor system is supposed to help perception. However, in our experiment perceptual discrimination was held constant; performance (d') did not change across conditions. So if it is predictive coding that is driving the effect in the motor system, then this is evidence that it doesn't help perception contra to what lots of people claim. 3. Sure you can use d' as your dependent measure instead of percent correct. Ad 2) Yeah. It's put clear and simple enough for me in your "The cortical organization of speech processing" in J. Comm. Disorders.